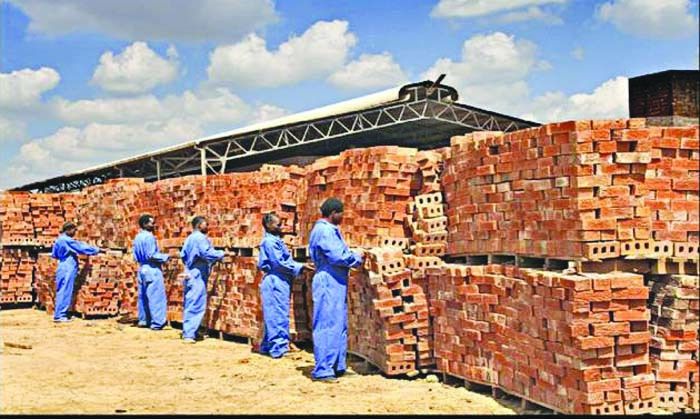 BRICK manufacturing company, Willdale, has seen a spike in business as Zimbabweans, fearing a return to hyperinflation, rush for safe investments, the company's chief executive officer, Nyasha Matonda, has said. Government's introduction of bond notes has raised fears of massive money printing, which is already taking place through the real time gross settlement platform but has been concealed through a deliberate strategy to keep the market short of bank notes. There has been an astronomical rise in investments on the stock market as a result, and Matonda said the brick market was also benefiting as people sought to preserve value by building properties. The Zimbabwe Stock Exchange has moved northward for the most part of this year, with market capitalisation hitting an all-time high of $14,6 billion on Tuesday. "We are currently enjoying brisk business as a lot of people are going into construction. The current situation is looking positive for us because people are looking for what they can put their money on and normally property becomes the number one area where one can preserve assets or cash," Matonda said. He said that the company, which has just closed its financial year, had done well overall and this would be reflected in its results. "In the past three weeks, that is what has been happening, and we are happy for that environment to continue. Year in year, we should have gone up by more than 23 percent in terms of volumes," Matonda said. The Willdale boss said that the company was also targeting the festive period when sales usually rise as Zimbabweans, coming home for the holidays from abroad, buy bricks for their projects. "We are already stocking up to ensure that we don't run out of product during the rainy season. That's when diasporans come back for holiday and that's when they want bricks," he said. Zimbabweans fear that bond notes are essentially a return of the abandoned Zimbabwe dollar. Although government and the central bank have denied that bond notes are a currency, the fact that they are a medium of exchange, whose value the Reserve Bank insists is at par with the greenback, makes bond notes a currency. Willdale is in the process of disposing 190,1 hectares of land, a move which it said would unlock value in the land that was otherwise idle as well as reducing the company's debt burden. The company said that the land was not suitable for mining clay for its operations. It expects to raise a minimum of $4,75 million from the disposal. It hopes that by settling its interest bearing obligations, it would increase the company's chances of attracting new loans for recapitalisation. The land forms part of Swanwick of Teneriffe of Kinavarra in Mount Hampden, adjacent to the land currently being utilised by the company for brick manufacturing. Zimbabwe has a housing backlog of at least two million units, with Harare alone in need of an estimated 500 000 houses.